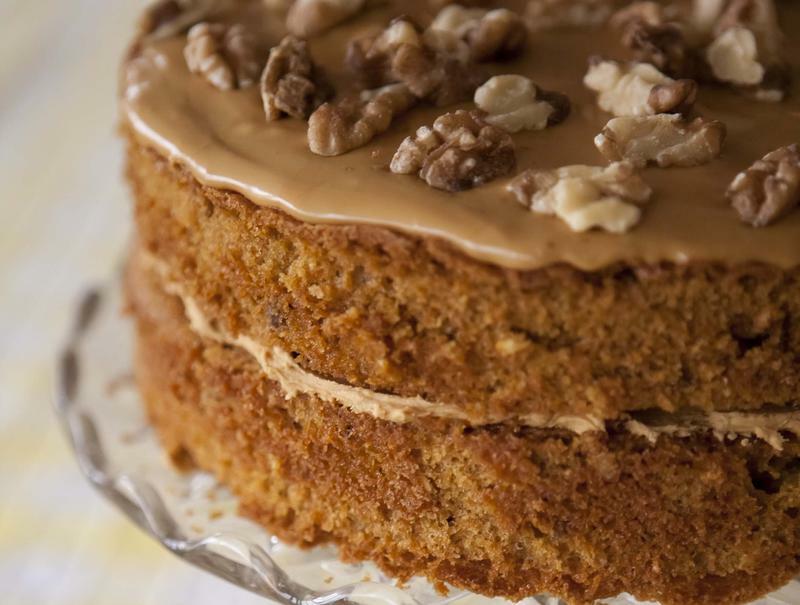 This traditional cake never fails to please; its bitter-sweet flavours make it one of Pam's all-time favourites. She likes to use old-fashioned Camp coffee essence for the coffee bit, however, you can use instant coffee or very strong freshly brewed coffee instead. In a large mixing bowl, using either a wooden spoon or a hand-held electric whisk, beat the butter to a cream. Add the brown and caster sugars and beat until light and creamy. Add the eggs, one at a time, adding 1 tbsp flour with each and beating thoroughly before adding the next. Stir in the coffee essence. Now carefully fold in the remaining flour, half at a time, with a large metal spoon. Fold in the chopped walnuts, and sufficient milk to give a soft dropping consistency. Meanwhile, prepare the buttercream. Beat the butter to a cream, add the icing sugar and the coffee essence and beat until light and creamy. To make glacé icing for the topping, sift the icing sugar into the bowl, add the coffee essence and 1-2 tbsp boiling water, and mix until thick. Spread one of the cooled cakes with the buttercream. Sandwich together with the second cake and cover the top with the glacé icing. Finish with the chopped walnuts. This cake will keep for a week in an airtight tin.